This is one kitty that won't mind hanging out in your Christmas tree! Great for cat fans of all ages, this Cute Kitty Ornament makes a wonderful gift or stocking stuffer for any cat lover on your list. 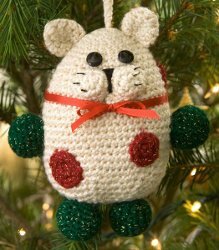 You could also use this cute crocheted ornament as a gift tag or embellishment on your holiday gift package. Use up all your yarn scraps by crafting cats of all colors and make yourself a colorful ornament set in no time! Gauge: 14 sc = 3”; 18 rows = 4”. Unless otherwise indicated, do not join rounds; instead, place marker in first st of round and move up as work progresses. When changing colors, work last st of old color until 2 loops are left on hook, drop old color, yo with new color and complete st. Fasten off old color. Round 1: 6 sc in 2nd ch from hook – 6 sts. Round 2: 2 sc in each st around – 12 sts. Round 3: * 2 sc in next st, sc in next st; repeat from * around – 18 sts. Rounds 4, 6, 8, 10, and 12: Sc in each st around. Round 5: * 2 sc in next st, sc in next 2 sts; repeat from * around – 24 sts. Round 7: * 2 sc in next st, sc in next 3 sts; repeat from * around – 30 sts. Round 9: * 2 sc in next st, sc in next 4 sts; repeat from * around – 36 sts. Round 11: * 2 sc in next st, sc in next 5 sts; repeat from * around – 42 sts. Round 13: * 2 sc in next st, sc in next 6 sts; repeat from * around – 48 sts. Rounds 14-23: Sc in each st around. Round 24: * Sc2tog, sc in next 6 sts; repeat from * around– 42 sts. Round 25: * Sc2tog, sc in next 5 sts; repeat from * around– 36 sts. Round 26: * Sc2tog, sc in next 4 sts; repeat from * around– 30 sts. Round 27: * Sc2tog, sc in next 3 sts; repeat from * around– 24 sts. Add stuffing. Round 28: * Sc2tog, sc in next 2 sts; repeat from * around– 18 sts. Finish stuffing ornament firmly. Round 29: * Sc2tog, sc in next st; repeat from * around –12 sts. Round 30: Sc2tog around – 6 sts. Fasten off, leaving a long tail. With yarn needle, weave tail through remaining sts and pull tight. Weave in ends. Sew both pieces of Muzzle together down center; sew onto Body. With embroidery floss, stitch nose and mouth according to picture. Thread 3 pieces of floss through Muzzle, trim ends to ½” and stiffen with glue. Sew Spots randomly over Body. Tie ribbon around Kitty’s neck. With A, ch 25. Sew into loop at top of Ornament. Round 6: * Sc2tog, sc in next st; repeat from * around – 12 sts. Round 7: Sc in each st around. Fasten off, a leaving long tail. Stuff firmly. Round 2: [2 sc in next st, sc in next 2 sts] 2 times – 8 sts. Round 4: Repeat Round 3, changing to A in last st.
Rounds 5-14: With A, sc in each st around. Fasten off, leaving a long tail. Stuff firmly. Round 1: 4 sc in 2nd ch from hook – 4 sts. Round 2: [2 sc in next st, sc in next st] 2 times – 6 sts. Round 3: * 2 sc in next st, sc in next st; repeat from * around – 9 sts. Round 4: * 2 sc in next st, sc in next st; repeat from * around to last st; 2 sc in last st – 14 sts. Round 6: * Sc2tog, sc in next st; repeat from * around to last 2 sts; sc2tog – 9 sts. Fasten off, leaving a long tail. Do not stuff. Round 1: 6 sc in 2nd ch from hook, join with a slip st – 6 sts. Round 2: Ch 1, 2 sc in each st around; join – 12 sts. Round 3: Repeat Round 2 – 24 sts. Fasten off, leaving a long tail. With the wider part of the body at the bottom, use long tails to sew Arms & Legs, Ears, and Tail to Body as pictured. Attach Eyes securely with sewing thread and needle. Cute & simple! Can't wait to try this! And I found it just in time for christmas this year! Thank you.